Finally I get to post about my favorite finished object EVER. I knit this afghan / lap blanket for my aunt, who is a wonderful and creative person. She has knitted for years, but now she spends more of her creative time making beautiful jewelry, plates and ornaments from fused glass. She has always inspired me, and she gave me a set of knitting needles and crochet hooks, and started me knitting. This was both a terribly frustrating and boring, and a wonderfully satisfying project. It took me many hours, and when I got to the 576 stitch section, it took 22 minutes for EACH ROUND!!! So it truly felt like it would never be finished. But by the time I got to the lace, it was addictive, because I knew I would soon be done. The knit-on border took a terribly long time as well, but when it was done and blocked, it became such a lovely piece of work I almost couldn’t give it away!! It’s wonderful! I would never have enough patience to knit that project, but I enjoyed seeing yours! It’s stunning! 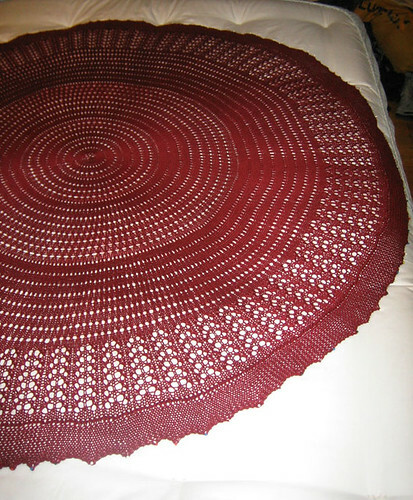 One day I’d like to make a Pi shawl myself!